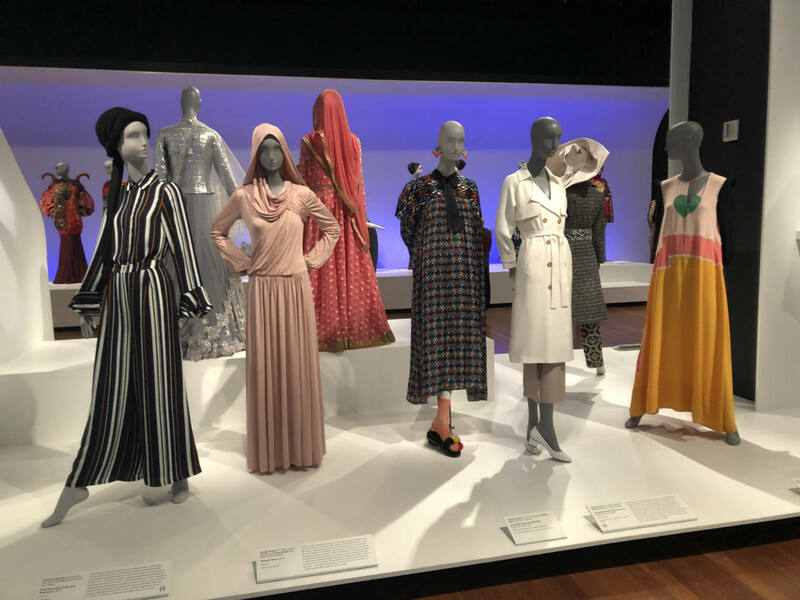 I couldn’t help but wonder, as I walked through the de Young museum entrance with the sole objective of viewing the exhibition Contemporary Muslim Fashions: will this be as strange as I think? It wasn’t, but it did challenge my beliefs about Islam, Muslim women, and what freedom really means. “Strange” was my initial descriptor because, while I’m not racist in the least toward Muslim people, I am suspicious of Islam. From the outside, it’s a restrictive, conservative, misogynistic and homophobic culture, one in which I wouldn’t feel welcome, on behalf of my own person or the women in my life I hold dear, who’re anything but subservient, second-class citizens. I’ve never been to The Middle East or Southeast Asia, where most majority Islam countries reside, though I have been to Morocco, where I had a few bizarre run-ins—like my female travel mate wanting to wear shorts out and me insisting we would surely be arrested, or going to a co-ed dance formal with a bunch of college-age Moroccans, where the lights were on max brightness, men and women hardly touched, and no alcohol or drugs were even perceptible. On the other hand, how much of this painted picture of Islam is controlled and perpetuated by Western media, for political purposes? It’s a valid question, since so much of our assumptions about life are through biased media—capitalism is a big one. And, objectively, it appears as though many Islamic societies are loosening their conservatism. Saudi women are now allowed to drive. Emirati states seem to attract a global population, Westerners as much as Easterners who work in banks, airlines, or other modern businesses. Most of the designers were Muslim themselves, about half female. Toward the end, the names got bigger and more recognizable: Dolce & Gabbana, Valentino, Dior, Chanel. Luxury is a big business in The Middle East, after all, though it’s traditionally been driven by accessories, which are unrestricted as part of dress codes. No matter how I felt about the culture and religion itself, the designs were truly exquisite, incorporating fine materials, embellishments, creative drapes, and interpretations of the hijab (head covering). There was also a video installation on loop of Mona Haydar’s “Wrap My Hijab” rap. I thought it was great—I sat and listened to it for a while. There’s something endearing, exotic, and pleasantly subversive about the growing female empowerment movement, especially in The Middle East, given its traditional toxic masculinity. And then I thought: who is freer? Well clearly gays are freer to be themselves in the West. But would society be better off without drugs and alcohol? Is unfettered capitalism, with the illusion of a meritocracy, better or worse than a dictatorship? These are all rhetorical questions. I know we’re better off, corporate dictatorships or not. But the world is full of oppression, power struggles, cultural strictures, and varying degrees of exploitation, no matter where you look. I guess it just depends on what kind you’ve known since birth, what kind you have the option to become a part of by choice, and which elements of freedom are most important to you. Perspective seems to be key in this equation. Clearly there is a pretty wide berth of creative freedom with which designers have created garments that fit within the accepted Muslim dress code. Connotations and wider judgements aside, the Contemporary Muslim Fashions collection of abayas and hijabs, gowns and athleisure, is fascinating, for the fashion-lover and layperson alike. Along with Susanne Bartsch: Art-A-Porter and Dalì / Schiaparelli, it’s just the latest in a trend to see culture and art through the lens of garments and wardrobes. Contemporary Muslim Fashions is on through January 6 at The de Young Museum in San Francisco’s Golden Gate Park.